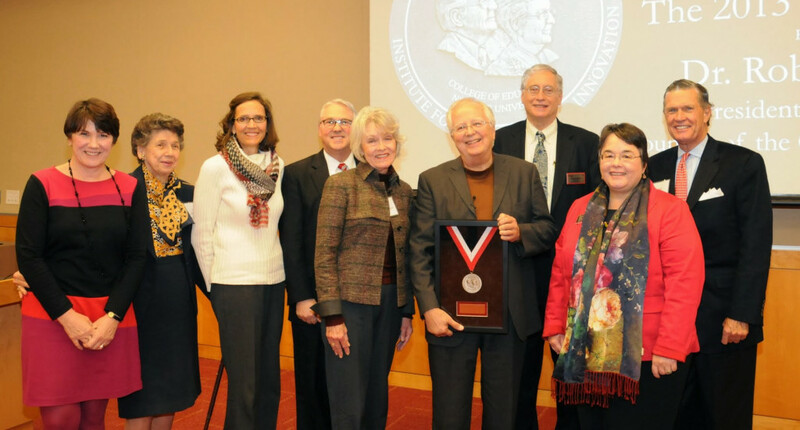 Dr. Robert Tinker was awarded the 2013 Friday Medal for his innovative work in education using technology. November 22, 2013 – North Carolina State University honored Dr. Robert Tinker at the Friday Institute for Educational Innovation’s Friday Medal Presentation on Wednesday, November 20, 2013. The Friday Medal is awarded annually to honor significant, distinguished and enduring contributions to education and beyond through advocating innovation, advancing education and imparting inspiration. “I know that Mr. Friday would be very pleased to have Bob receive this award, both for what he’s done, and how he’s done it… always open to other ideas, supporting and encouraging others, and caring very passionately about education for all students,” said Dr. Glenn Kleiman, executive director of the Friday Institute. 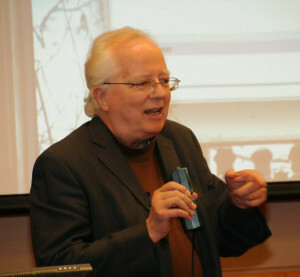 Tinker is president emeritus and founder of the Concord Consortium. He has, for 35 years, pioneered research on innovative approaches to education using technology. His group created and studied the first applications of “probeware”— sensors connected to computers to give students powerful, flexible instruments. The Consortium also created one of the first virtual high schools which became a nonprofit. His current research involves providing support for student science investigations and applying pattern-recognition software to teaching graph interpretation. Dr. Robert Tinker demonstrates a simple motion detector he uses to teach students about graphs during his presentation at the Friday Medal ceremony. “I’ve been fortunate enough to get paid for doing what I really love. And what I really love must be in my genes, because there really could be a better name than Tinker to describe what I do,” Tinker said. He then demonstrated two online tools the Concord Consortium has made available at a website called the Molecular Workbench. At the end of his presentation, he spoke about the major changes made to education in the past 50 years, and declared that “it’s about time” for another overhaul in math and science education. “We essentially as a nation redid our educational system for math and science. We haven’t done that kind of fundamental change since. That was 50 years ago… Even if we didn’t have technology, it would be time to make a major change,” Tinker said. Tinker then announced that he quit the Concord Consortium less than two months ago and is planning to begin a new project – the Deeply Digital Initiative. The focus of this initiative will be on providing students a more interactive education using technology. During the ceremony, time was taken to remember Mr. William Friday, who passed away Oct. 12, 2012. Dr. Randy Woodson, Chancellor of NC State, described Friday as an “inspiration” who did much for the state. “Without the vision of Bill and Ida, none of this would have been possible,” Dr. M. Jayne Fleener, Dean of the College of Education, said. To honor Friday’s legacy, Shaun Kellogg was announced as the first Friday Graduate Student Fellow. The Friday Fellowship is a highly prestigious program that enables NC State to attract exceptionally capable and dedicated students who will complete their doctoral degrees while contributing to the work of the Friday Institute. Kellogg will receive support for his dissertation research as he pursues his PhD in the College of Education Instructional Technology program. He is currently a research associate at the Friday Institute where he is researching online professional development and online communities.